Latest Bahrain Job Vacancies – Urgently Required for an Industrial Plant Construction in the State of Bahrain. Candidates who are Seeking for the Latest Bahrain Job vacancies can check the details of Latest Bahrain Job Vacancies In Airport that have been recently posted in this Site. Here we are Updating all the details about the Bahrain Job Vacancies like Job Description, Salary details, Educational Criteria, required Criteria etc.., Interested and Eligible candidates can apply for the Job recruitment. Project Control Managers, Superintendent – Civil Construction / Safety / Piping. Deputy Managers – HSE . Engineers – Planning (Civil), QC Inspectors – Civil / Electrical. 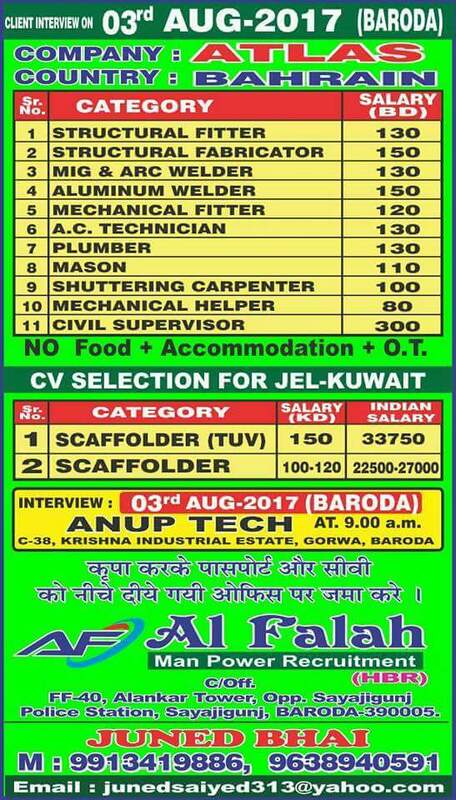 HUGE BAHRAIN JOB VACANCIES – Supervisors – Civil / Saftey / Electr / Piping / Scaffolding / Rigging / Scaffolding. Leadmen – steel Fixer / Mason. Quatity Surveyors – Civil. structural Fitters, Land Surveyors, Autocad Operators – Civil Building. Saftey Officers – Nebosh / IOSH / OSHA. Electricians, foreman – Electrical / Scaffolding / painting / Civil / Steel Fixer / Rigging. Structural Welders, Controllers – Equipment / Document / Material. Bar Bending Schedulers, Store Keepers. Visit this Site and check the latest Gulf Job Vacancies that have been recently Posted in this Site. Client Interviews For Bahrain job vacancies.Hiring for a leading Oil and Gas Co.
Guf experience is mandatory.Large Recruitment for the following positions. Apply Immediately with your CV,copies of passport,certificates etc. AL KOBAISi GROUP BAHRAIN ALKOBAISI GROUP ONLY ECNR PASSPORT ANY GCC 140+OT+ACC VALID LIC HEAVY DRIVER 180+OT+ACC ANY GCC VALID LIC MOBILE CRANE OPT ANY GCC 150 OT-ACC VALID LIC CONCRETE PUMP OPT 15 150 OT ACC STORE KEEPER 90+OT+ACC RIGGER 70 OT ACC LABOUR 85 OT ACC STEEL FIXER MASONS 85 ACC S/CARPENTER 35 95 OT ACC PLUMBER 100 0 T-ACC ELECTRICIANS 100 OT ACC GLASS CUTTERS Duty 8 Hrs Daily Over Time Documents 162 A. 2ND Floor, NEAR Abc TRADE CENTRE OPP. EscoRTs FORTIS. HOSPITAL GATE No.2 SARAI JULENA, Okhla NEW DELHI INDIA. Email ID: [email protected] website: inletjobs.com.